Why does the Legion’s national commander address the South Carolina Legislature each year? 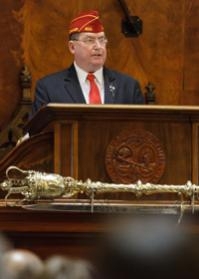 Q: Why does the Legion’s national commander address the South Carolina Legislature each year? A: There is no official policy or reason, but the tradition goes back to at least the early 1960s. In the past, the national commander of The American Legion addressed many more state legislatures during his travels, speaking on behalf of the organization and veterans across the country. The appearance before the legislature serves as the national commander’s official visit to South Carolina, which has chosen the appearance as its venue. One possible force behind the tradition may have been E. Roy Stone. Born in 1912 and raised in the state, Stone served in both war theaters in the Navy during World War II. He joined the Legion soon after his return home, and over the years served as a post commander, district commander, department commander, national commander by special vote of the national convention (in 1987), and a National Executive Committee member from 1953 to 2001. He died in April 2001 at 88; the next month, a meeting room at National Headquarters in Indianapolis was renamed for him.